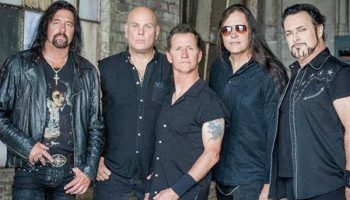 Interview: Mike Howe of METAL CHURCH – Spotlight Report "The Best Entertainment Website in Oz"
We recently had the chance to catch up with Mike Howe, vocalist of American heavy metal band Metal Church. We chatted about the song writing process of their new album Damned if You Do, a funny incident at a recent show, and the possibility of seeing them in Australia in the near future. SR. Your band Metal Church just released a new record ‘Damned if You Do’, how has that been going? It’s going fantastic, a lot better than we could have imagined, it’s an awesome feeling. There have been very kind reviews. SR. Have you got a favourite song off the record? SR. What did you do differently on this record, compared to previous releases? The way we go about writing and recording an album is essentially the same each time we write a record, we come up with song structures and then work together to belt out what we think each song needs. We keep what we like and put other stuff away for another day. We don’t overthink it, we want it to come from the heart. We know pretty quickly when a song is working or not, and if it’s not working, we don’t force it or beat it to the ground, we move on. We tried out some new techniques on this one and had fun with it. In the mixing phase, I get sent mixes every day and we talk about them, then we fix what needs to be fixed until the song is complete. I really love this record, you can really hear how well everyone performed on their instrument. It’s raw and I love it. SR. You guys have been together for over thirty years now, what’s the secret to the band’s longevity? Kurt is the one who holds it all together, he’s the man. *laughs* He’s been driving the train from day one and he’s kept it alive. We all have such an awesome friendship and connection in our songwriting. I’m very grateful that we have that, and the joy we get out of working together. SR. How did you guys originally meet and come together? I was in a band in LA, called Heretics. I originally moved from Michigan with my first band to try to make that work, but it didn’t, so I joined Heretic. We have a record deal with a mutual friend of Kurt, and Kurt was trying to branch out as a producer and asked if he could work with Heretic. He came to LA and worked with us, and that was when we first connected. After that Heretic album was done, Metal church were looking for a singer and Kurt asked me to audition, of course I took him up. I tried out for the band, and a couple months later metal church’s first record was out with me as the singer. SR. Have you been to Australia before? I have never been there before, Metal church have been itching to go there our whole career. I’ve had a bunch of interviews with Australians recently, and I really want to go there, we’ve never had the opportunity. I hope there are some promoters that can reach out and give us a chance to get down there. We would love that so much, we just need to be offered something first. I have no idea how to gauge our fan base in Australia, so it’s hard to figure it all out, I’m hoping a promoter will take a chance on us. SR. What’s the funniest thing that’s ever happened during a live show? One of the recent things that happened is that at a show, our Bassist had a spinal tap moment. I jump off the stage sometimes and get down in the audience, and one night we were playing at a place with a really tall stage. The bassist got really excited and jumped off into the pit amongst the people, and he couldn’t get back up onto the stage *laughs*. It was so funny, I had to stop singing because I was laughing so hard, he was struggling so hard to climb the stage with his bass and kept falling back down. It was a funny moment for us. SR. What’s next for the band, tour wise? We’re doing our usual summer festivals in Europe, we accept any offers we get and then make it into a full European tour. We’re working on a spring run of the USA at the moment, so as soon as that comes together, it’ll be up on our website. Hopefully we’ll get some offers from Australia too, then we can finally head down under. SR. Do you have any messages for your fans in Australia? Thank you so much for supporting us. If you know any local promoters and want to see us tour down there, let them know. Who knows, you could be seeing us very soon. I’m not sure what the metal scene is like down there, but we’d love to come and play for you. We have so much gratitude for our fans, thank you for sticking with us. We appreciate you all so much, from the bottom of our hearts. 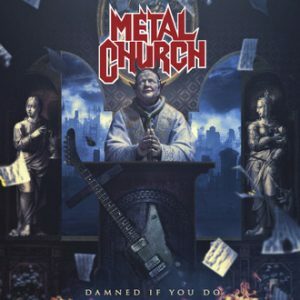 You can listen to Metal Church’s new album Damnèd if You Do on iTunes or Spotify. To keep up to date with what the band is up to, follow them on social media or via their website. If you’d like to see Metal Church playing at a venue near you, spread the word, and we could see them here soon.